The Ebricks.com Toilets guide offers information about companies such as Neo-Metro and St. Thomas Creations. Manufacturer of distinctive bathroom fixtures, faucets, sinks, and mirrors. Whirlpool tubs, bidets and toilets are among the offerings. Headquartered in Germany, Duravit is an international leader in the production of sanitary ceramics, bathroom furniture, bath and spa products. Represented in 80 countries, the company's US showroom is in New York City. Company markets green, water and energy saving products to retailers. Signature product is its award-winning One2flush, a dual flush toilet conversion kit. Manufacturer of designer plumbing products in lines from modern to retro. Products include lavoratories, tubs, sinks, toilets, faucets, showerheads and lighting. 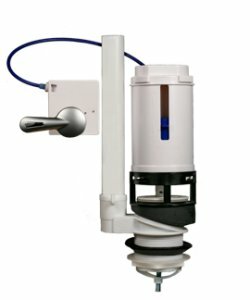 This company was born after the publication in 1998 by the Wall Street Journal of an article highlighting stainless steel prison toilets that had been installed in the bathrooms of a high-end San Diego house. Today, using stainless steel, the company makes a diverse line of plumbing fixtures -- toilets, tubs, tiles, showers and more. Online sales of decorative door, cabinet, and window hardware, kitchen and bath products, and home lighting. Free catalog featuring 154 full-color pages of plumbing, hardware, and lighting products. Specializing in steam showers, this company also imports contemporary and European style vanities, toilets and whirlpool baths. Australian company designs, manufactures and exports bathroom fixtures. Credited with designing the first dual flush toilet, and a leader in development of water saving fixtures. Products available worldwide. A leading manufacturer of bath and kitchen products, American Standard Brands was formed from the merger of American Standard Americas, Crane Plumbing, and Eljer in 2008. Products are marketed under brand names American Standard, Porcher and Jado, among others. PO Box 6820 Centennial Ave.
Well known manufacturer of toilets, faucets, bath tubs and other kitchen and bathroom products. Authentic reproduction antique bathtubs, water closets, and pedestal sinks and plumbing are the main products of this salvage operation turned manufacturer. The California company also makes replacement claw feet and hard-to-find plumbing parts. Large plumbing manufacturer of toilets, sinks, faucets, showers and new water-saving, dual-flush toilets. San Francisco company designs and sells bidet-style heated toilet seats that feature warm water washes and heated air. American manufacturer of luxury bathroom fixtures including steam showers, whirlpool tubs, vanities, and water saving toilets. Also makes walk-in bathtubs and handicap baths. This relative newcomer to the American residential faucet market (2000) has grown by leaps and bounds. It now offers thousands of models of kitchen and bath faucets, toilets, sinks, and showers. Great name for a company ... and nifty stuff too. This company makes super-sized toilet seats, if you hadn't guessed. This online retailer of bathroom vanities and appliances offers free ground shipping. Midwest company specializes in hard-to-find repair parts for antique sinks, tubs and toilets. Also carries a large selection of vintage bathroom fixtures. Online retailer of reproduction bathroom sinks, toilets, clawfoot tubs, faucets and other plumbing items in antique-style. This California company produces refrigerators and freezers that can be used with solar, hydro, wind power or with direct current on a boat or in an RV. Models are available in 12- or 24- volt DC or 110- or 220- volt AC. Also produced are composters, composting toilets and vaccine refrigerators. DIY kit turns a standard toilet into a water saving dual-flush model. 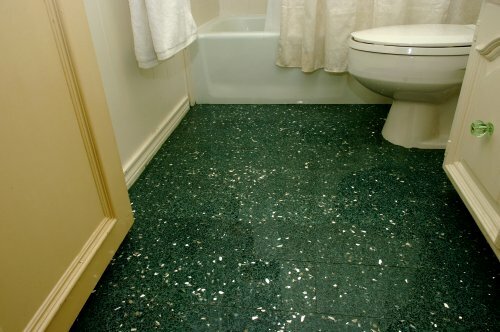 A cost-effective aggregate tile made of recycled bathroom fixtures.